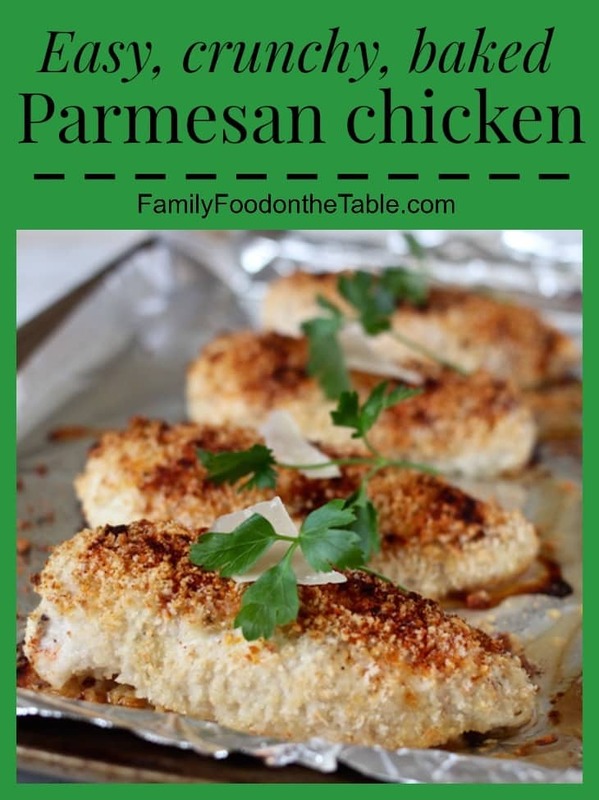 Parmesan chicken is an easy weeknight chicken dinner that’s simple but scrumptious! This is a super simple dinner that looks and tastes like it was very involved. But really, it comes together with minimal effort. A fast and easy dredging station and voila, a fancy dinner! It’s also unbelievably crunchy. Panko breadcrumbs are magic like that. I love when my ingredients do the hard work for me. 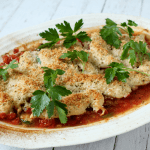 This Parmesan chicken is also a go-to around here because it doesn’t involve any crazy ingredients. All things you probably already have in your fridge and pantry. Gotta love that when you get home from work, stand in front of an open refrigerator and are stumped as to what to make for dinner. Been there. 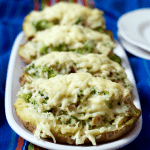 This is a great, simple fall-back dinner that’s sure to be a hit with the whole family. 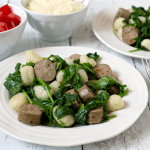 While the chicken is in the oven, you can whip up a simple farro salad, or do some fast “baked” potatoes with a spinach salad or steamed broccoli and you’ve got a delicious, easy, healthy dinner on the table. 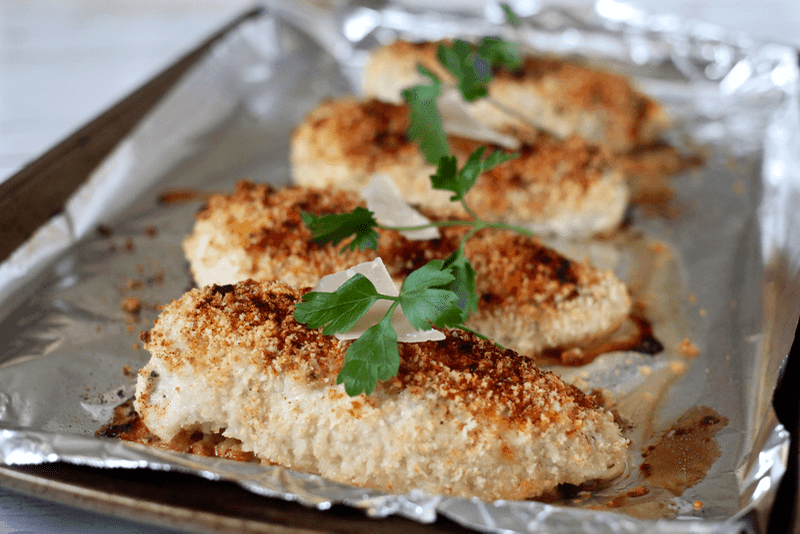 If you’re wanting to keep it extra light, you could slice and serve this crunchy chicken over a salad or in a wrap with some greens and roasted veggies. Very versatile. Hope this becomes one of your weeknight go-to favorites. Enjoy! 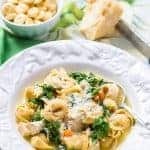 An easy weeknight chicken dinner that's simple but scrumptious! Preheat oven to 400. Line a baking sheet with aluminum foil and spray with cooking spray. Combine Parmesan cheese and panko breadcrumbs in a shallow bowl. Place buttermilk (or milk and lemon juice) in a separate shallow bowl. 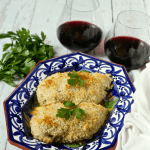 Dip chicken in the milk mixture, then move to the bowl with the cheese mixture and press down, helping the cheese and breadcrumbs adhere to all sides. Place chicken in prepared baking dish. Repeat with remaining chicken. 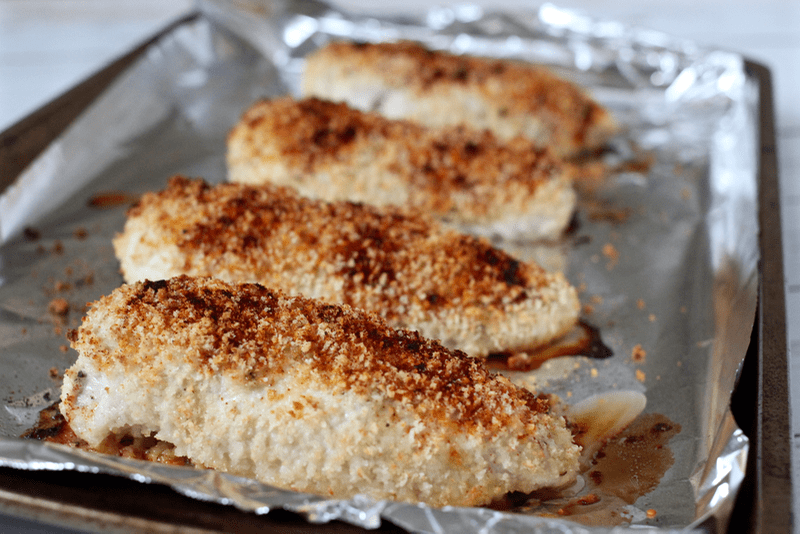 Sprinkle any remaining cheese and breadcrumbs on top of chicken. Sprinkle each chicken breast with paprika. Bake at 400 for 25-30 minutes, or until cooked through. Serve and enjoy! I love easy meals! I’ll be adding this to the fall lineup during the sports season! Can’t go wrong, right? Thanks Linda! I love using panko. 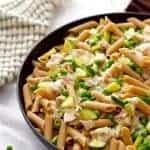 My kids love this simple dish. Thanks for sharing at #Throwback Thursday. Please join us again and remember this week will focus on Thanksgiving recipes. Panko is the best little trick, isn’t it? Thanks for hosting, Quinn and I look forward to all the festive dishes this week! Tried this dish tonight and it was great, super easy, fast and tasty. I loved the crunchy crust thanks to the Panko. I will definetly make it again. Thanks Kathryn for helping me to add a dish to my rotating menu!!!!! I’m SO happy to hear you enjoyed it Carmen! Thanks so much for taking the time to let me know!